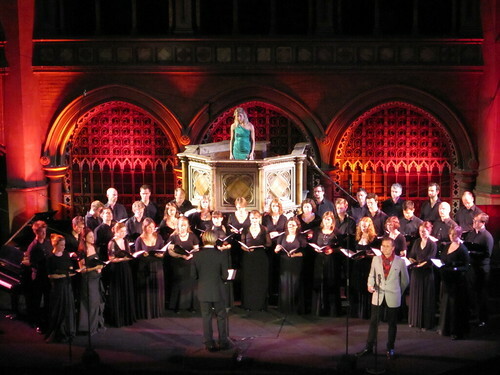 Eric Whitacre Concert, originally uploaded by webmink. Busy day Tuesday, which included the great pleasure of going to hear Eric Whitacre conduct his superb choir performing a number of his works including some new ones – you’ll remember I mentioned this concert a while back (and if you don’t, be sure to follow that link and watch the video). Notably, he has set the classic children’s story “Goodnight Moon” to music, and his wife Hila sang it gorgeously with just a piano accompanist instead of the orchestral setting that will be on his new album next year. Each of the full-choir pieces was a delight, invoking a union of Tallis, Tavener and Vaughan-Williams. Despite a strong ‘classical’ flavour, the concert ended with a full-choir encore of Lux Aurumque, the piece that started his Virtual Choir idea. I had been due to interview him in the afternoon but his publicist called to cancel just as I was leaving home – Eric was “still writing” (presumably the piano arrangement) and was not free. I hope to interview him soon to discuss his views on creativity and copyright in today’s society. Glad you like it. If you haven’t already, be sure to listen to Light and Gold, it is wonderful.